With the COOLPIX W100, developer Nikon is ready to enhance entertainment in swimming pools, on the beach and in the ocean for young and old children. The camera even has a special child-adapted menu. When it comes to underwater cameras, the first thing to consider is obviously the machine’s resistance: how many meters can it be immersed, and how resistant is it. In this regard, the Nikon Coolpix W100 has good features that are worth a high score. The camera responds to the IP68 standard, so it can withstand underwater at a maximum depth of 10 m per hour, and is completely sealed against dust and sand. With a camera that works at a depth of 10 meters and can shoot over 13 megapixels, there are great opportunities for extra fun in the swimming pool, on the beach or in the ocean. But this is a camera for the younger audience; as the new Nikon camera, does not appeal to divers or sports enthusiasts. According to Nikon, much has been invested in user-friendliness, and the camera therefore have a special menu easy for children to navigate. In addition to the camera’s waterproofness, it is robust enough to handle a fall from up to 1.8 meters in height. The camera can also handle temperatures down to -10 degrees, so the camera can also be a good company when hitting in the ski slope. Images can be transferred wirelessly with Bluetooth to a mobile or tablet, and video is recorded in HD quality. Then, of course, you must ensure that the photographic quality offered by an underwater camera is satisfactory. In this, the Nikon Coolpix W100 demonstrates discrete features, albeit far from the standards of the best models. It’s about an 7 on a scale of 10, when it comes to capturing quality. By using the camera, it is always important to note how flexible it is and how easy it is to use. 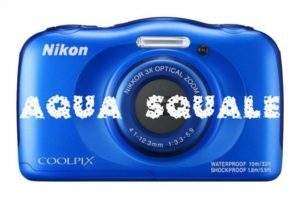 Also in this field, the Nikon Coolpix W100 is considered to be a good underwater camera, both because its use is very simple and because it has a fairly versatile degree. In addition to all the basic functions, the camera have a fully automatic shutter mode where we only have to press the shutter button and the camera chooses the ideal settings for the image itself. There are 8 other modes that we can select by hand.